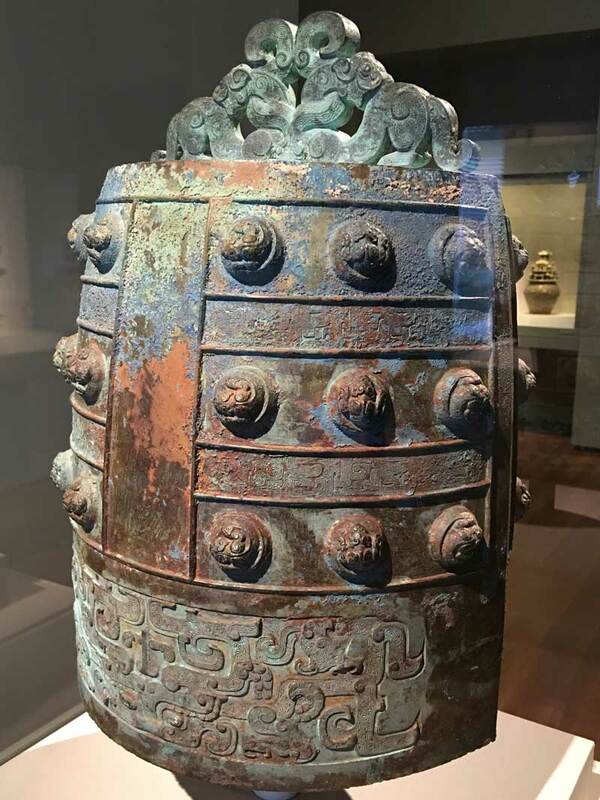 One of my favorite family traditions is that whenever we have the opportunity, and especially when we travel, we visit a museum. Over the Thanksgiving holiday we visited family who live in Cleveland, Ohio, so for this trip we went to the “newly” renovated Cleveland Museum of Art. 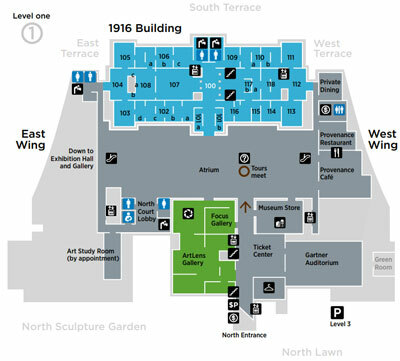 The renovations over the years (see the level one diagram here from their visitor guide) created a ‘square’ with its original building forming one side. The wings and galleries all house different art forms and eras. The museum has a wonderful gift shop and Café. As you can see from this layout, the Atrium is very large. Even though it was a holiday weekend I did not feel squished! 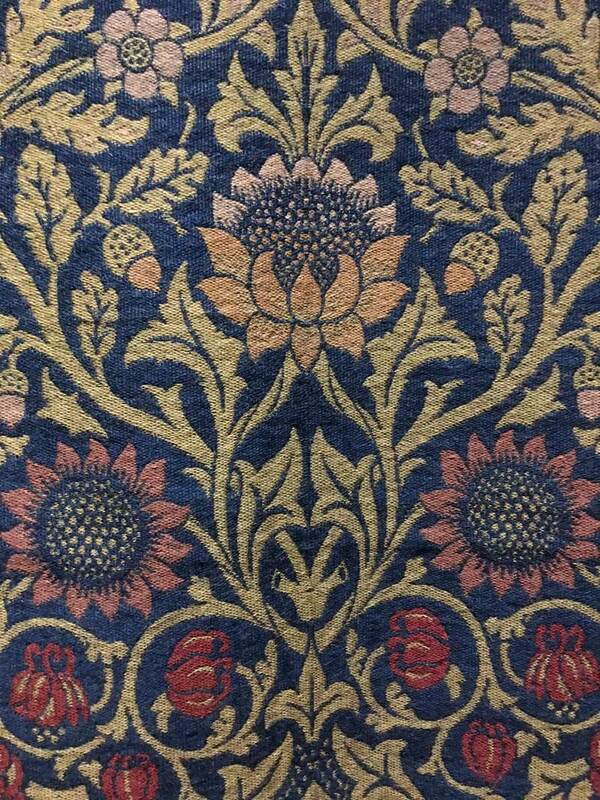 I love to take photographs of patterns, colors and textures, and then try to translate that inspiration to fiber. (I haven’t moved past the first step of taking the photos from this trip so far!) 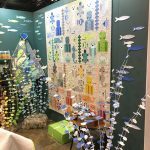 With this blog post I’m sharing with you some of my favorites… my challenge to you is to translate them to your art medium. If you do, please share! 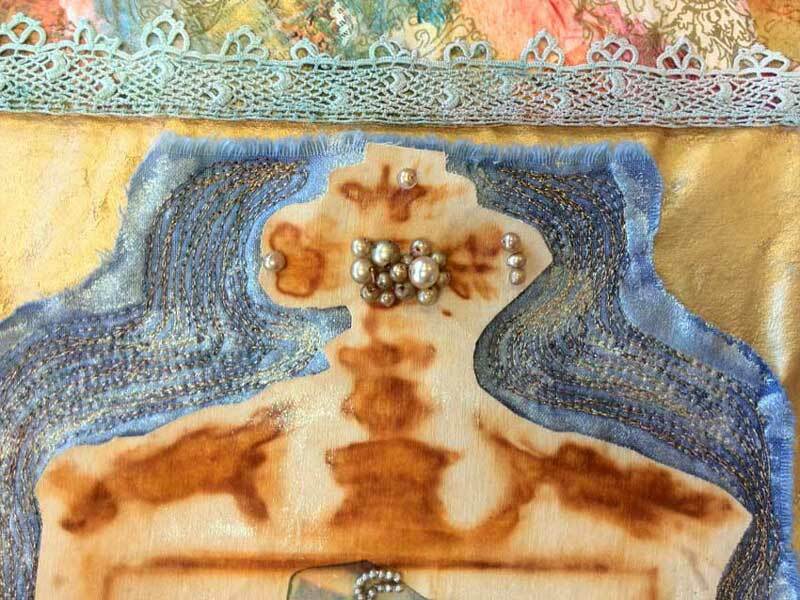 With the images above and below, I can visualize using Baked Textures Embossing Powder by Seth Apter to create an inspiration piece. 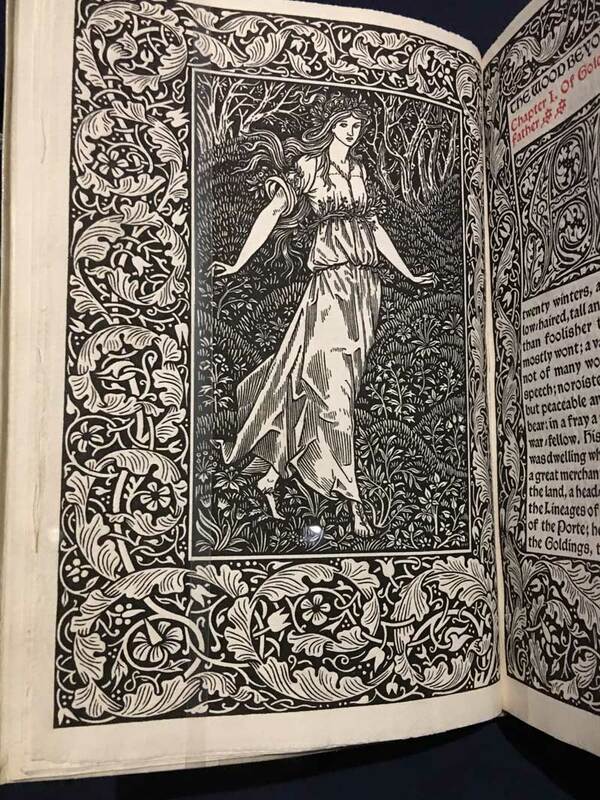 There was also a special exhibit with many products from the William Morris: Designing an Earthly Paradise exhibit open at the time. 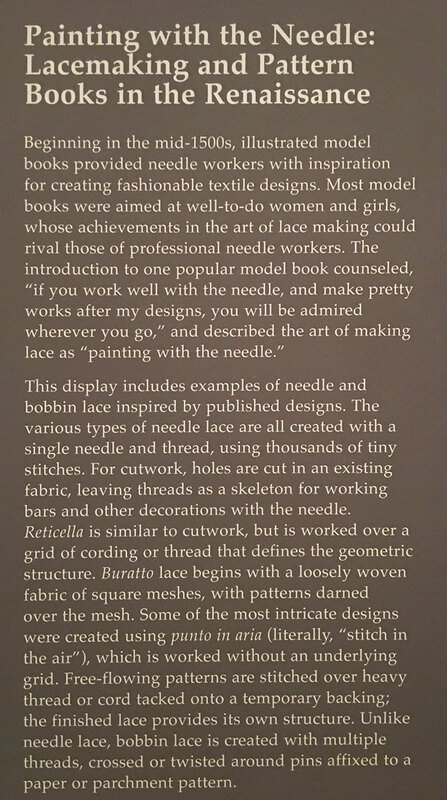 I’m including a photo of the sign that introduces the lace exhibit — beautifully expressed information! 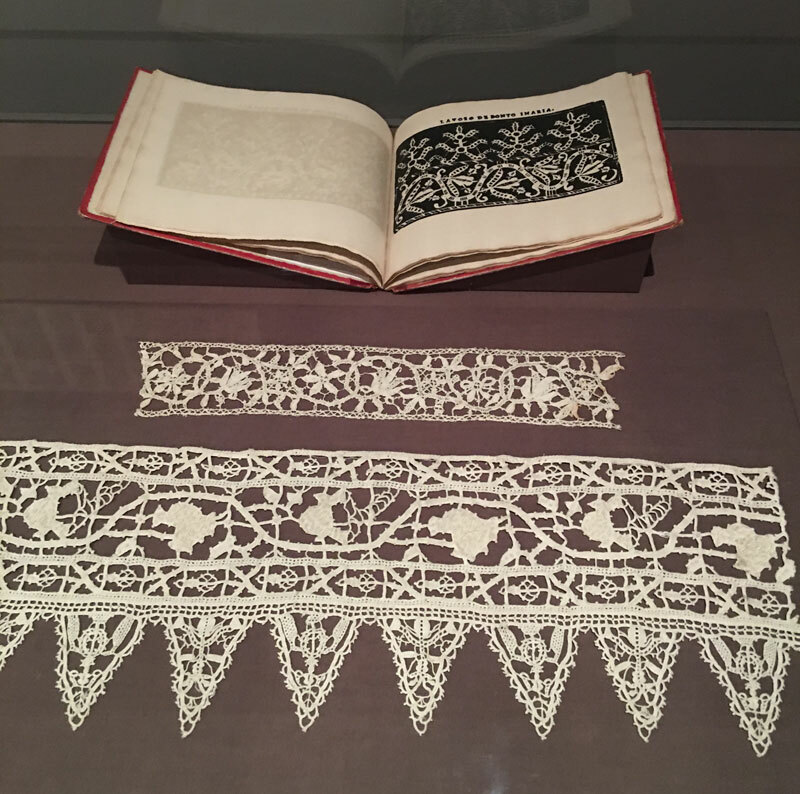 Artistic Artifacts hosts the “Doily Madisons” on the first Saturday of the month, the Washington, DC study group of the Chesapeake Region Lace Guild — it’s amazing to watch them tatting. It’s tough for a small business when more than one opportunity arrives at a time. 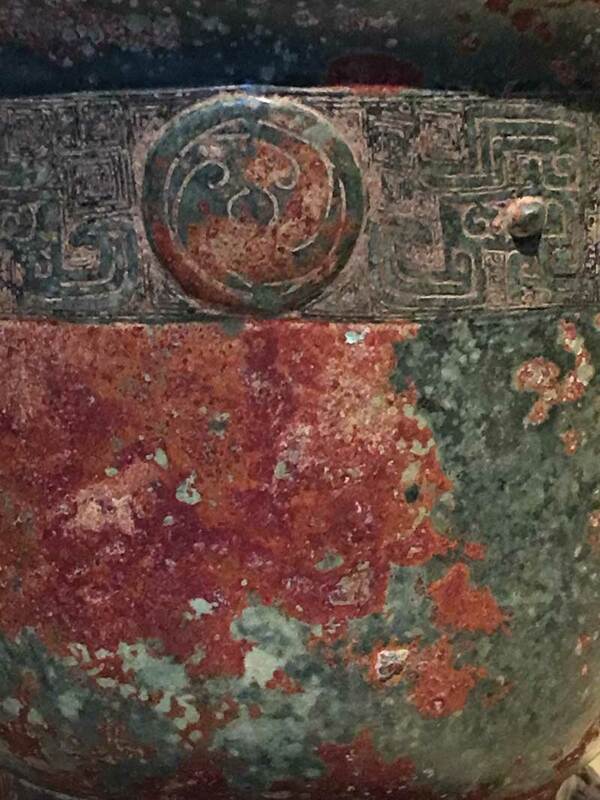 We’ve happily relied on Chris Vinh to help Artistic Artifacts be in two places at the same time in the past, and she’s just come through for us once again! 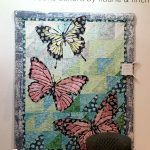 This summer, I was fortunate to represent Artistic Artifacts at two events hosted by the Asheville Quilt Guild. 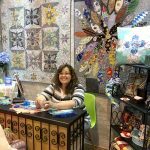 In June, we were invited to be a vendor at the North Carolina Quilt Symposium and most recently we were at the Asheville Quilt Show. The guild members at both events exhibited their Southern hospitality and welcomed us warmly. 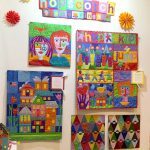 Photo: The Artistic Artifacts booth at the Asheville Quilt Show. For me, it was a bit of a homecoming as I was born in Asheville and my folks moved back to the area when I was in college. Hanging out for two weekends gave me time to visit some favorite spots with friends and family as well as to make new friends. 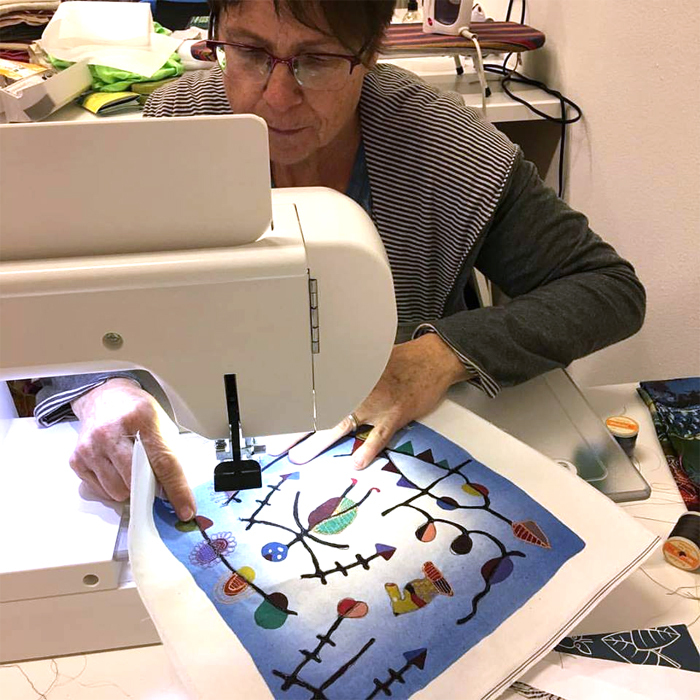 Even better was to have Barb Boatman, one of the Creative Minds who had taught at Artistic Artifacts and participated in a number of local artisan events at Del Ray Artisans, work the booth with me for both events. 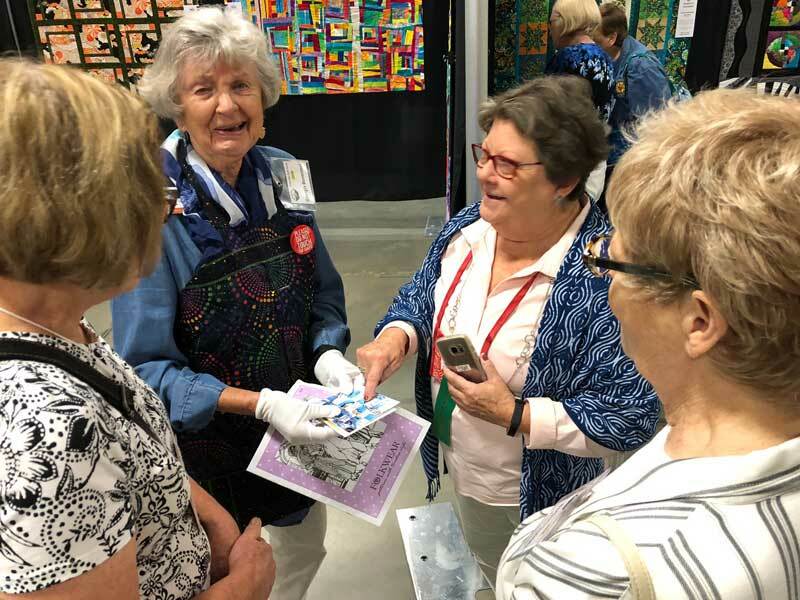 Barb retired to Hendersonville, NC this year and, in addition to helping with sales, she was welcomed into the quilting community by the folks we met. 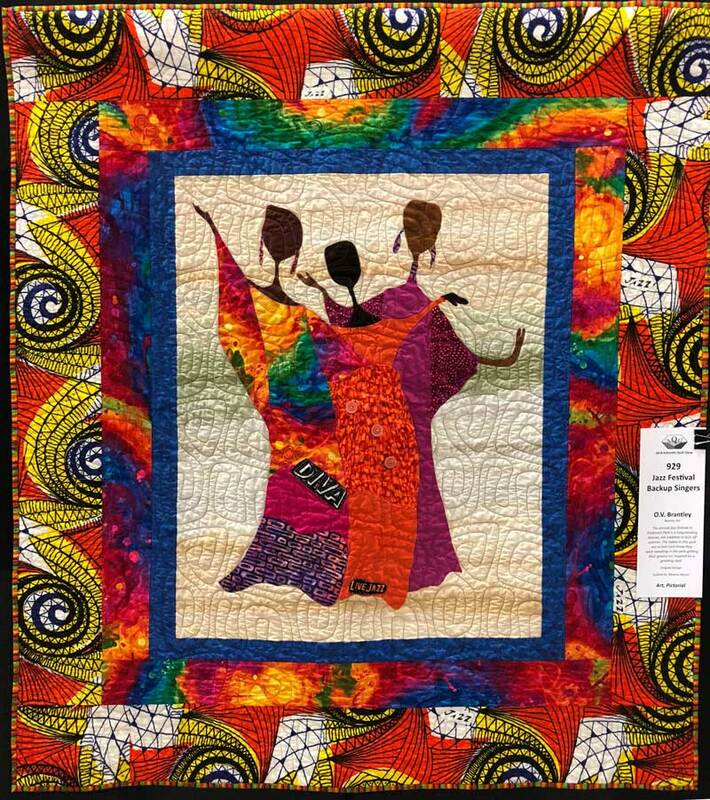 The North Carolina Quilt Symposium, Inc. is a non-profit corporation that was formed after the first North Carolina Quilt Symposium in Raleigh in 1979 The purpose is to promote and perpetuate the art of quilting through regularly sponsored symposia within the state of North Carolina and to sponsor other projects designed to preserve, continue, and advance this art form. 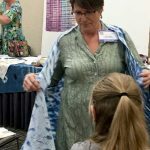 The Symposium is held in different areas across the state each year, and next year’s event is scheduled for May 2–5, 2019 at Lake Junaluska in Western NC. 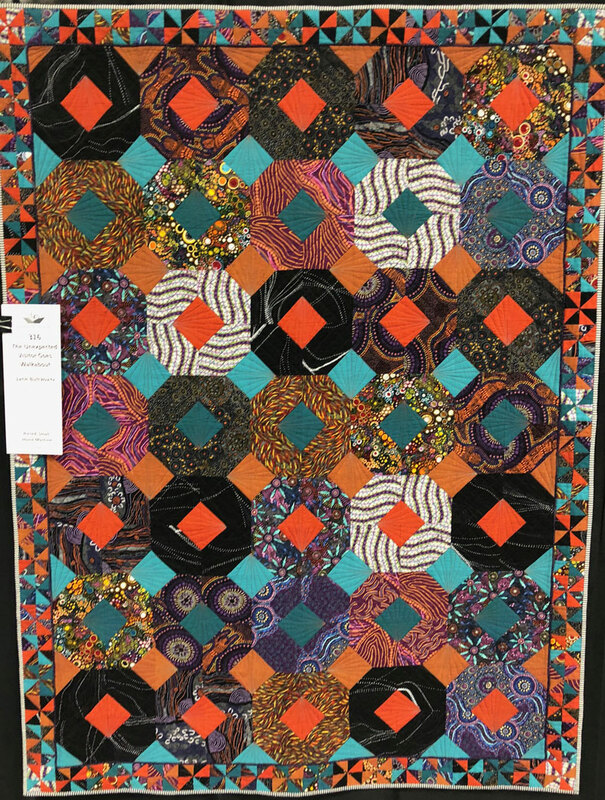 The event in Asheville had a roster of instructors and a display of award winning quilts from guild members. 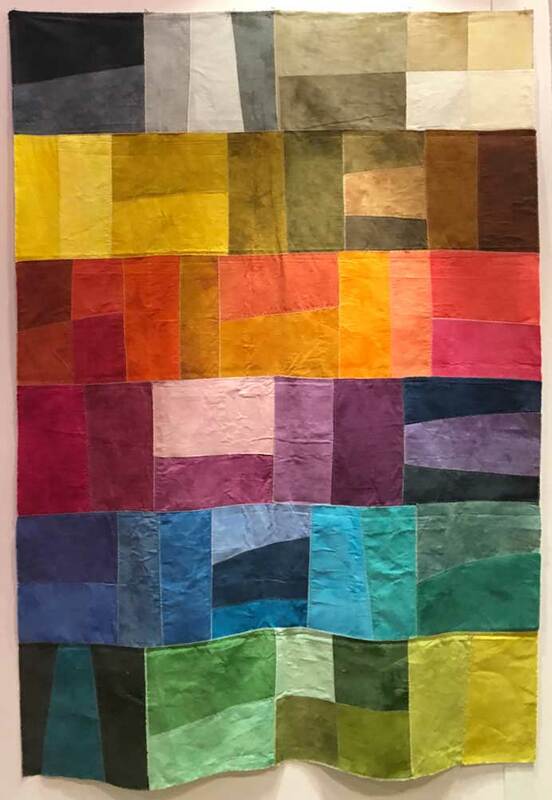 Photo: Susan Cleveland quilt “Seven Ringie Dingies.” Susan uses WonderFil Specialty Threads in her quilts and likes InvisaFil for her applique and stitch in the ditch quilting. 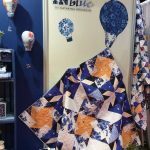 Susan has also worked with WonderFil to create namesake color-themed packs of Spagetti 12 wt 100% Long Staple Egyptian Cotton thread. 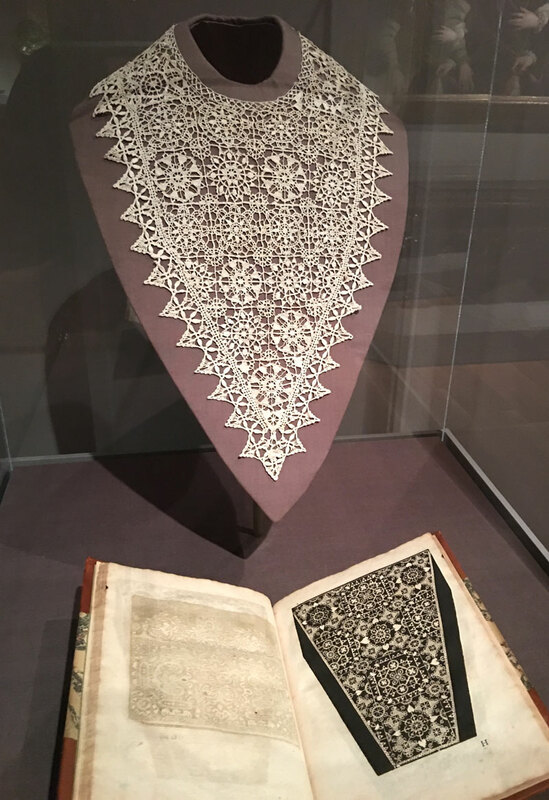 Photo: “Even with Brown” by Gyleen Fitzgerald, author of Trash to Treasure Pineapple Quilts and creator of the Pineapple Tool. 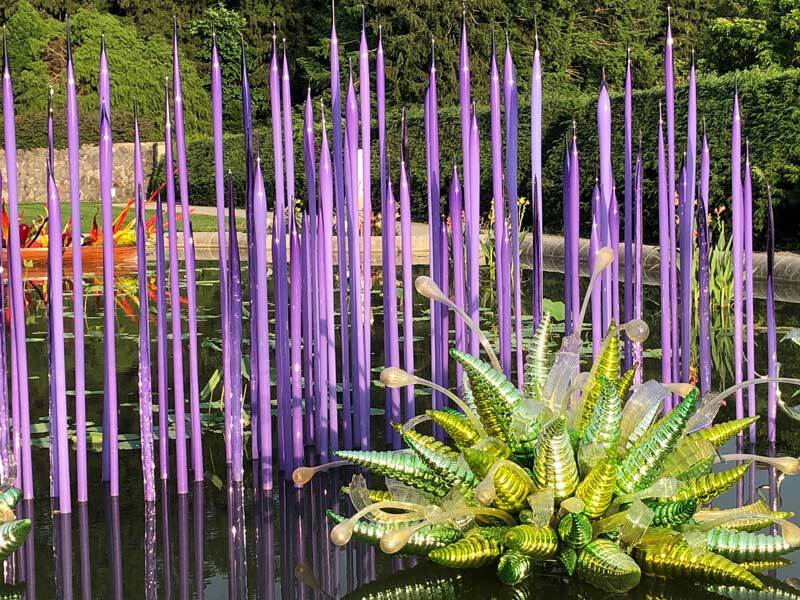 Photo: Chihuly at Biltmore, the first art exhibition in the estate’s historic gardens. Biltmore is one of Asheville’s most recognized attractions. 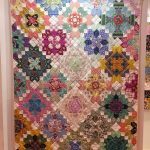 The Asheville Quilt Show is put on annually by the Asheville Quilt Guild. 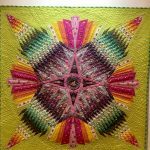 It is a juried show and open to all quilters and included over 350 quilts in addition to vendors, silent auction, demonstrations and lectures. 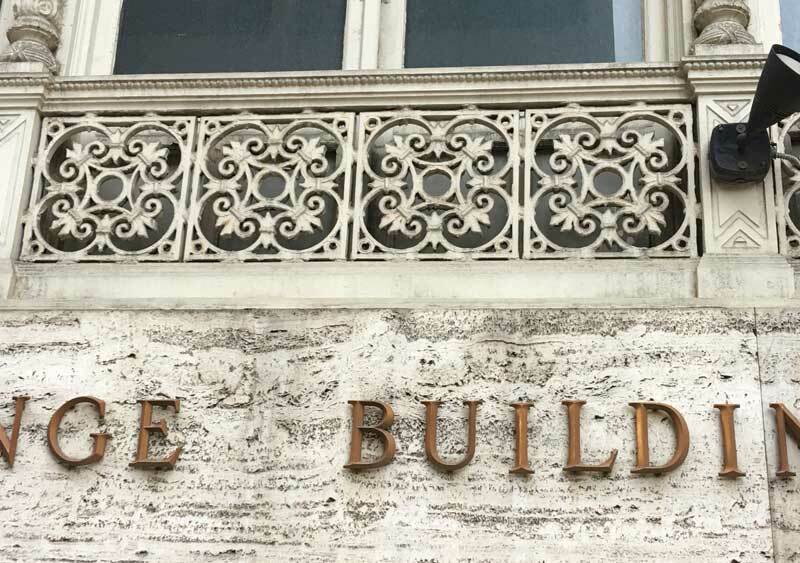 You can find this year’s winners on the guild website. Barb and I were kept busy all three days. 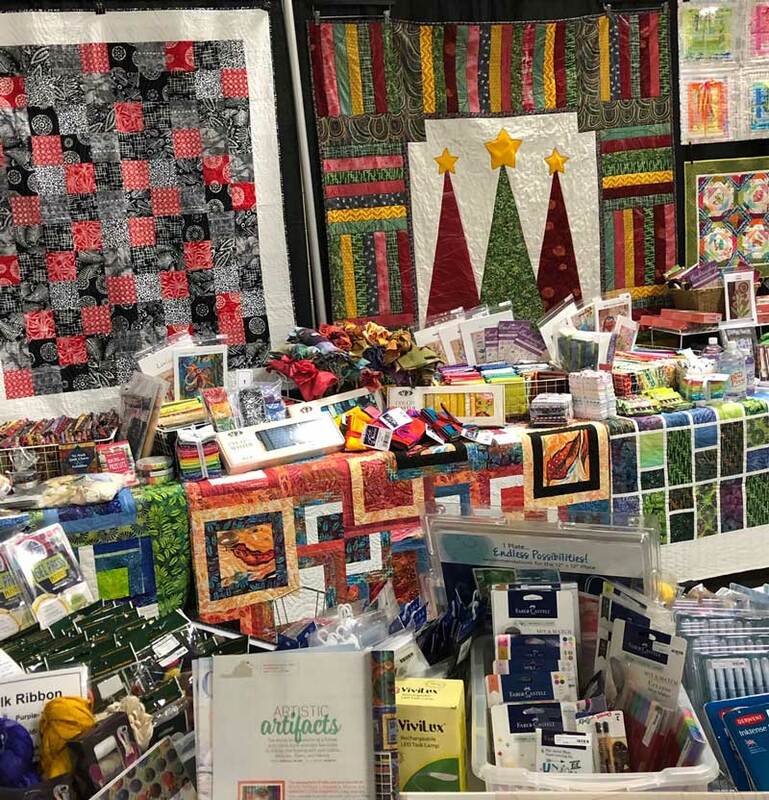 The photograph at the top of this post was taken after we set up; you can see the beautiful Artistic Artifacts version of Step Into Christmas quilt, created by Dudley Shugart. 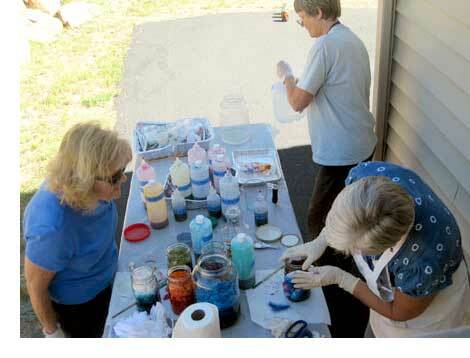 We met lots of loyal fans of Artistic Artifacts as well as introduced the shop to many new customers. 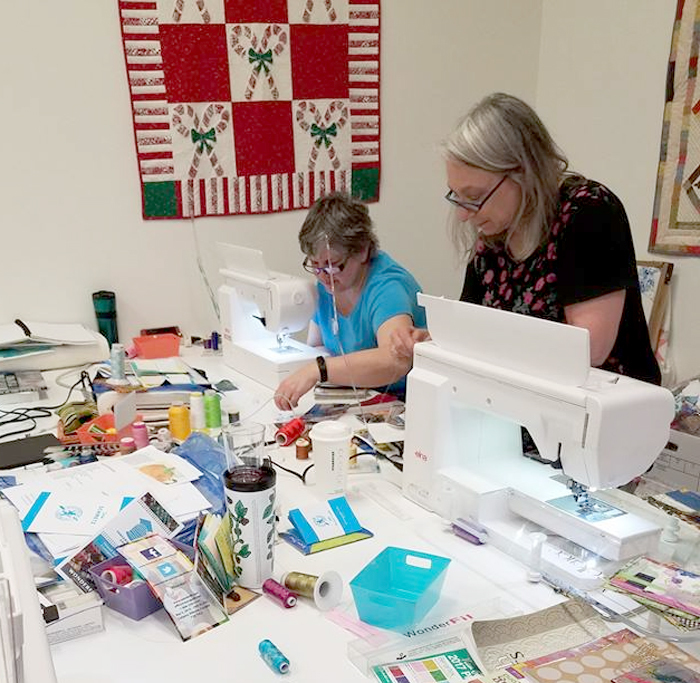 Photo: Barb Boatman, right, discussing her own style of quilting using strips of aluminum cans woven with fabric to Georgia Bonesteel, author of numerous books, host of The Lap Quilting series on television and producer of the documentary The Great American Quilt Revival. Georgia had work on exhibit and was volunteering as a guild member. 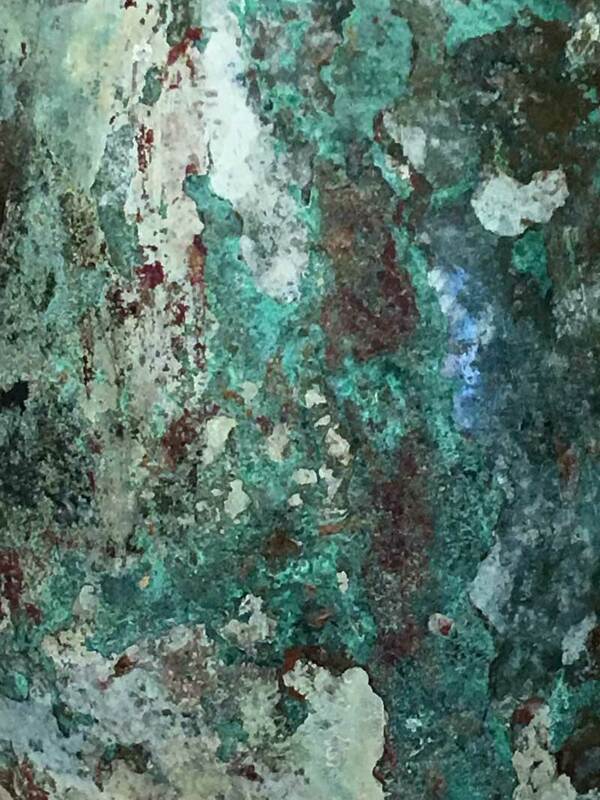 Photo: “The Unexpected Visitor Goes Walkabout” by Jane Butckovitz. 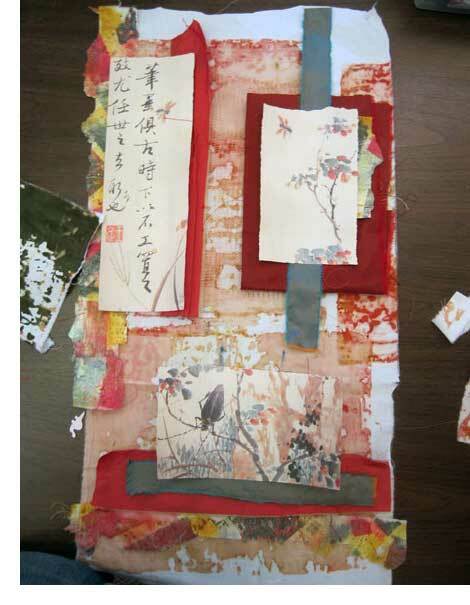 Her description stated, “I read a book on Japanese quilts saying they have an unexpected visitor somewhere. 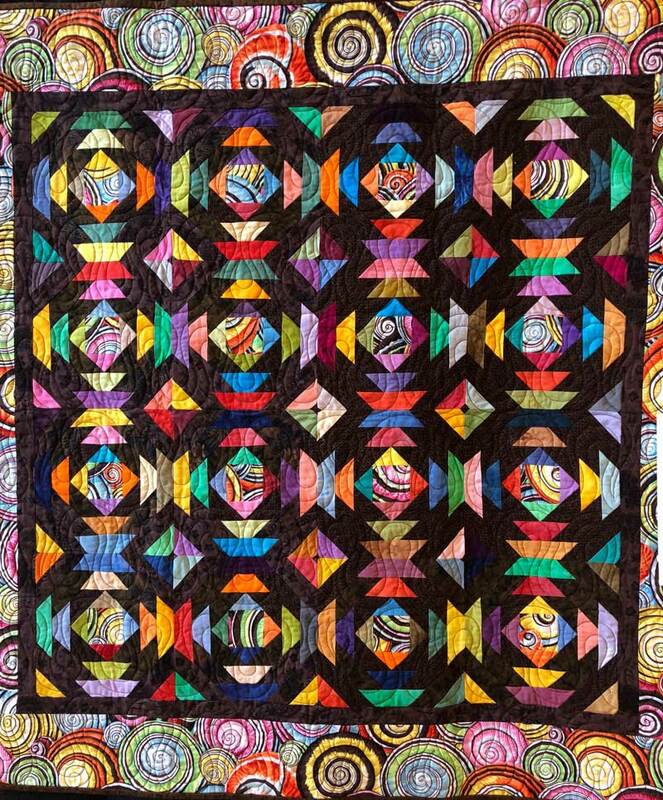 There is one in this quilt, mixed with Australian Aboriginal fabrics.” Can you find it? We spotted it! 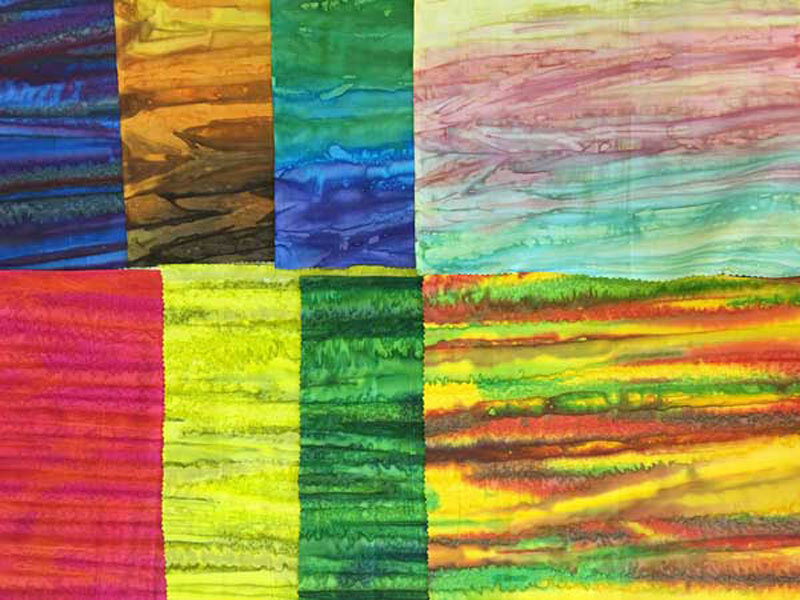 A block featured Effervescence by Amelia Caruso (center left ring). Photo: “Jazz Festival Backup Singers” by O.V. 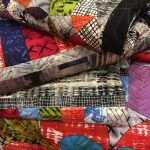 Brantley, Atlanta, GA. An original design with beautiful batiks and African Fabric. Revisited: Dye. Layer. Collage. Art. Art and inspiration are timeless, so while my original blog post about this 2010 event is no longer available, I wanted to share again, this time including additional photos taken by Liz. 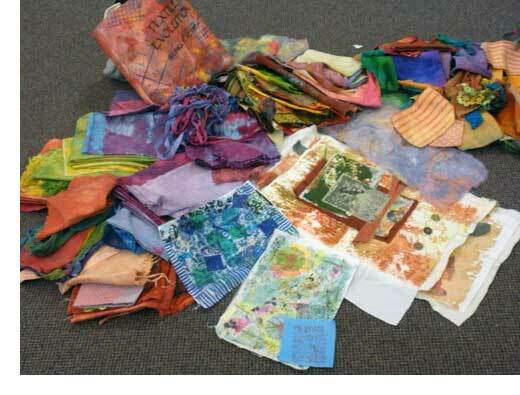 Day one also found us using fabric, tissue paper and paints to create fabric paper. 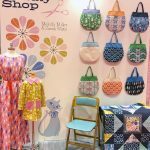 You can download Making Fabric from Paper by Beryl Taylor, a PDF tutorial from the Cloth Paper Scissors blog to learn how youreself. 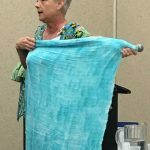 During the retreat we would finish out each day with show and tell, and in this photo (right) you can see finished sheets of fabric paper and piles of hand-dyed fabric being passed around. It was fun to see what students in the other classes were up to each day! 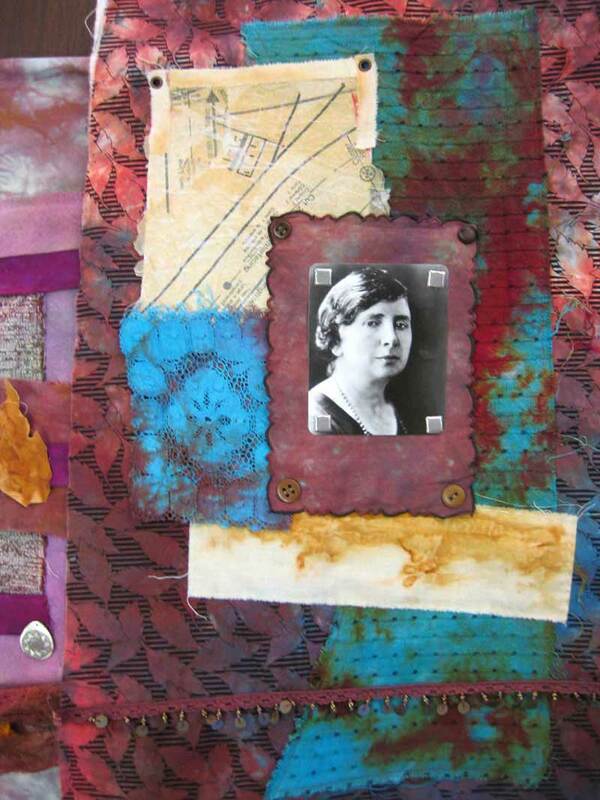 The above detail photo of my Lady with Brooch quilt shows some of the fabric paper and dyed trims, as well as the vintage brooch referenced in my title. 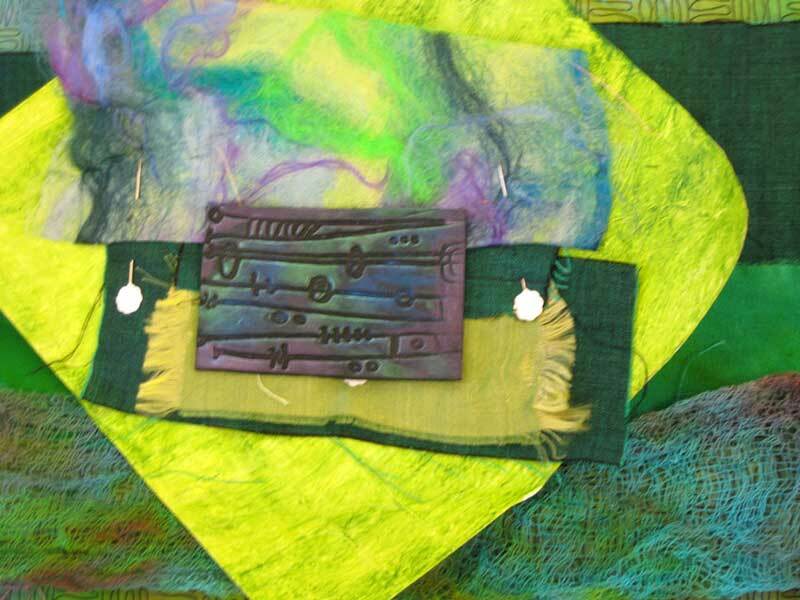 The second day of class, my students had a choice of continuing to make bits (a glimpse of which are pictured right; including some of the student work begun), or to immediately start in on designing their quilts. 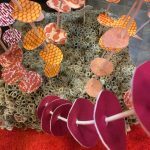 They had to do so without pencil, paper, or preplanning — just letting the materials speak to them. This was scary for all, but thanks to Cass Mullane and Laura Cater-Woods, every retreat attendee was issued a ‘permission slip’ to try something scary! 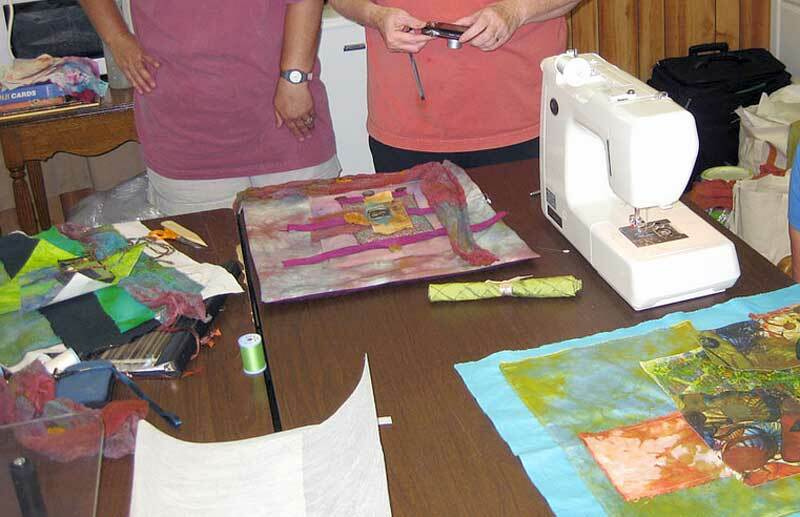 By beginning with an inspiration item such as a pin, photo or found object, they all were able to create a small art quilt that could be easily finished (if necessary) after the retreat concluded. 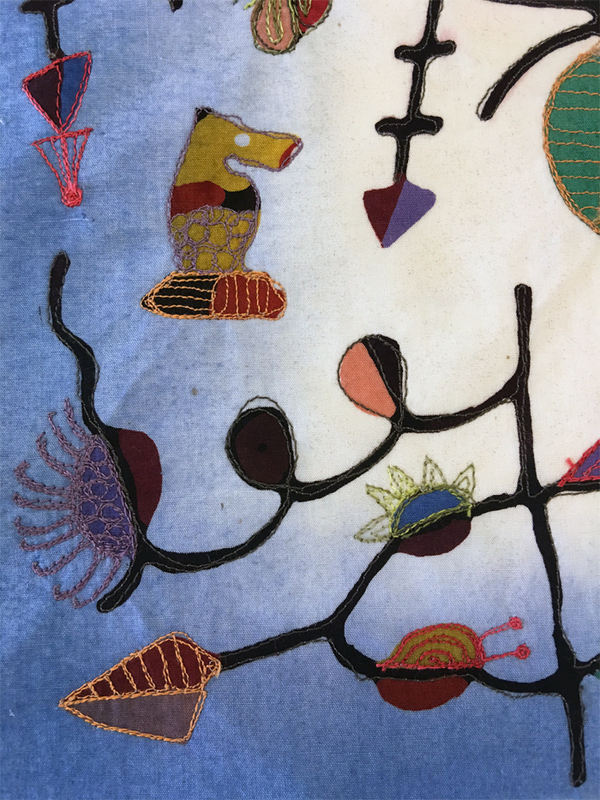 Above you can see students beginning to experiment with layering fabrics and textiles to find the design they wanted to complete. I was very proud of my students — they all stepped into the scary land of intuitive designing! Unfortunately I didn’t capture all of the work, but they all did a fabulous job. Above and below, student work experimenting with possible layouts. 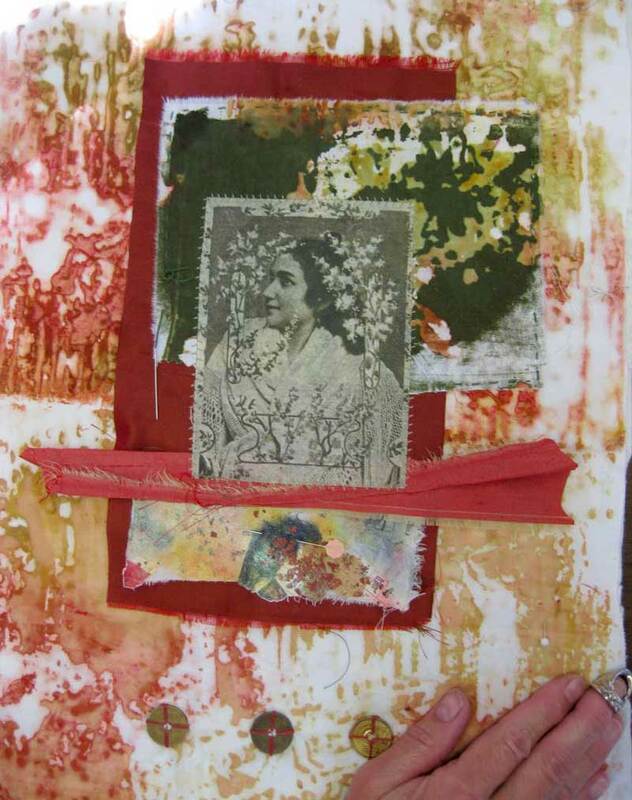 Below, Cathleen “Cat” Mikkelson’s collage composition. 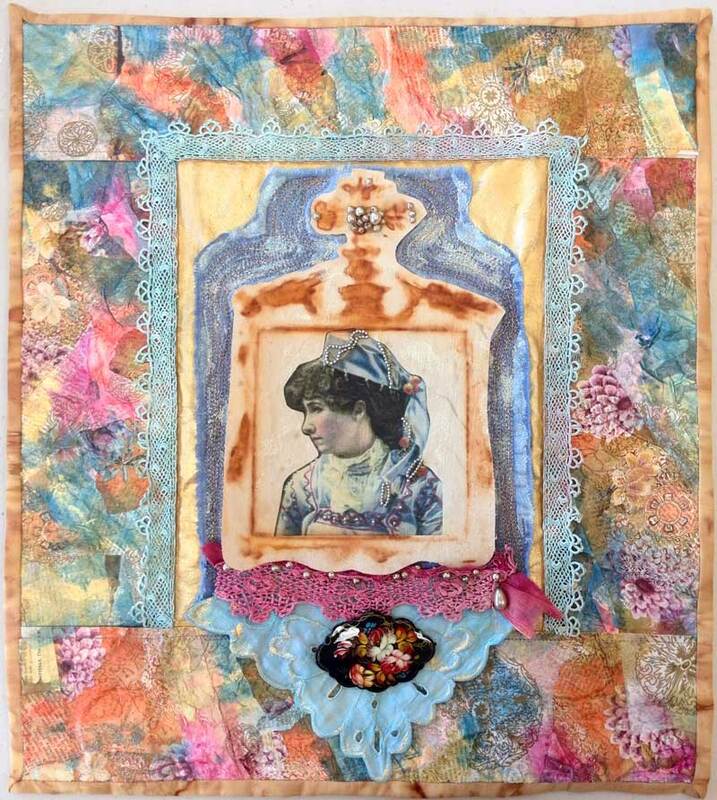 Cat’s inspiration was a “Famous Woman Card” that was included in the retreat Goodie Bag and her newly dyed fabrics. Above, Ruth Chandler at work composing two different pieces. 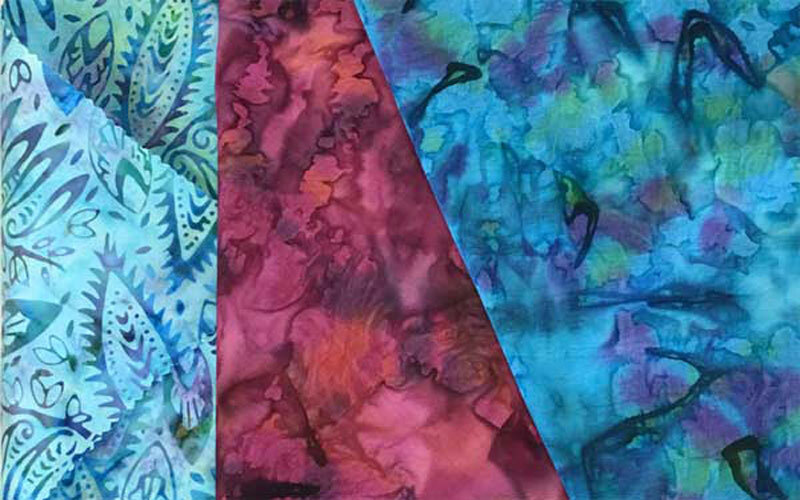 Ruth’s inspiration was the beautiful dyed and surface designed fabric she created combined with the photo, one of many I brought with me for student use. 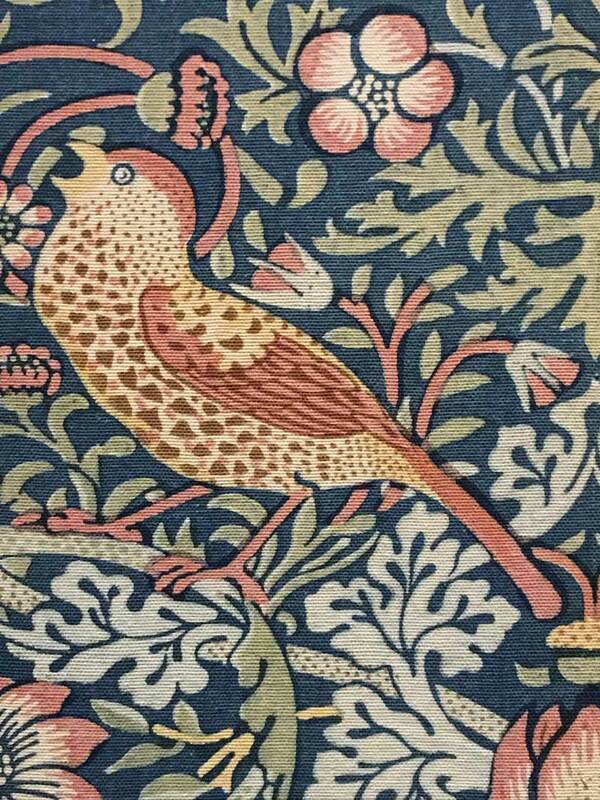 Here you see more of Ruth’s fabric, but for this piece, the inspiration was a 12 in. × 12 in. 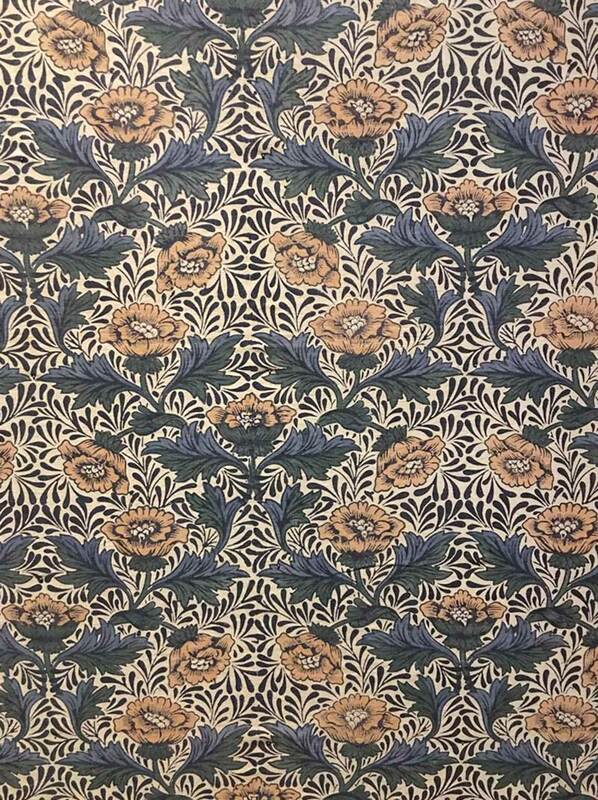 piece of scrapbooking paper! 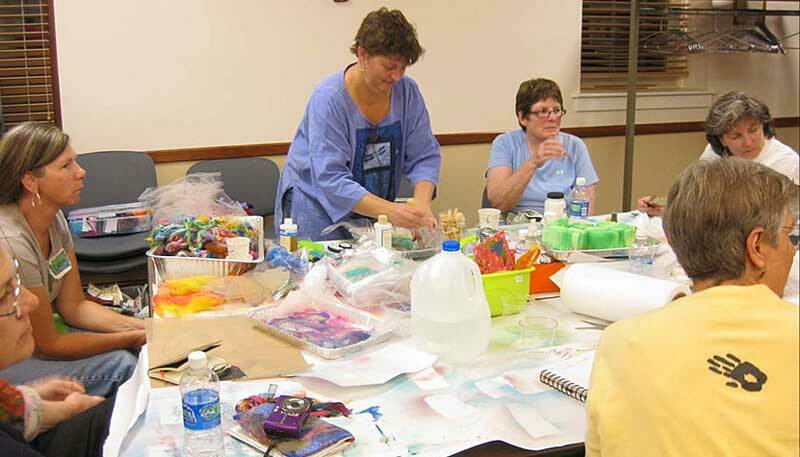 Other Artists who taught at Textile Evolution Retreat 2010 were Laura Cater-Woods, a wonderful art coach, artist and friend and Carol Sloan. My mother Pat Vincentz accompanied me on the trip to the retreat. 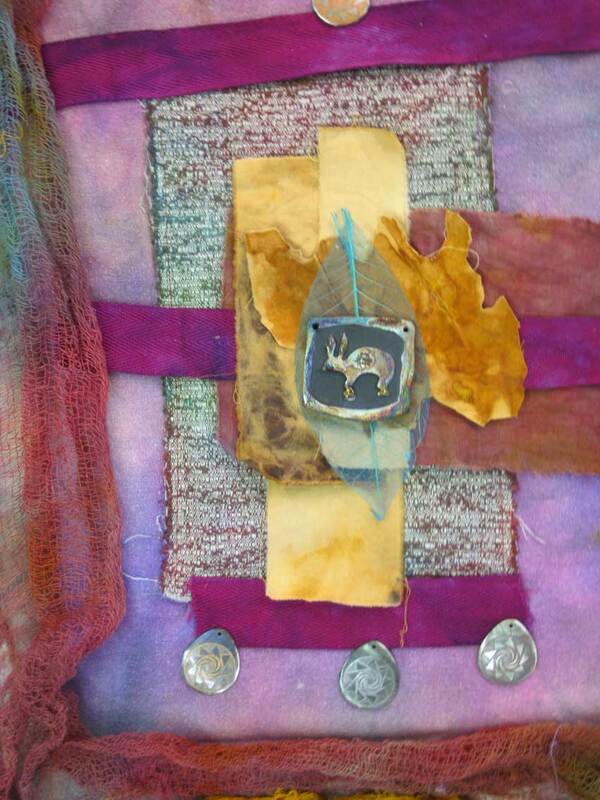 While I was busy teaching, she took Carol’s two-day mixed media class Scraps, Fragments and Artifacts. 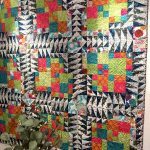 She enjoyed herself, met new friends and then surprised me with the most wonderful quilt ever! There was a photo of me and my mom holding it, me sweaty and sobbing. 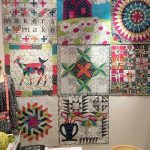 With my first blog post, I wrote that my readers were to “Keep in mind this quilt was a surprise and I was crying like a baby! 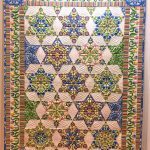 I also had been working outside in 90 degree sunshine…you are supposed to be looking at the quilt!” This time around, I’m going to spare myself that embarrassment and just post the beautiful keepsake. 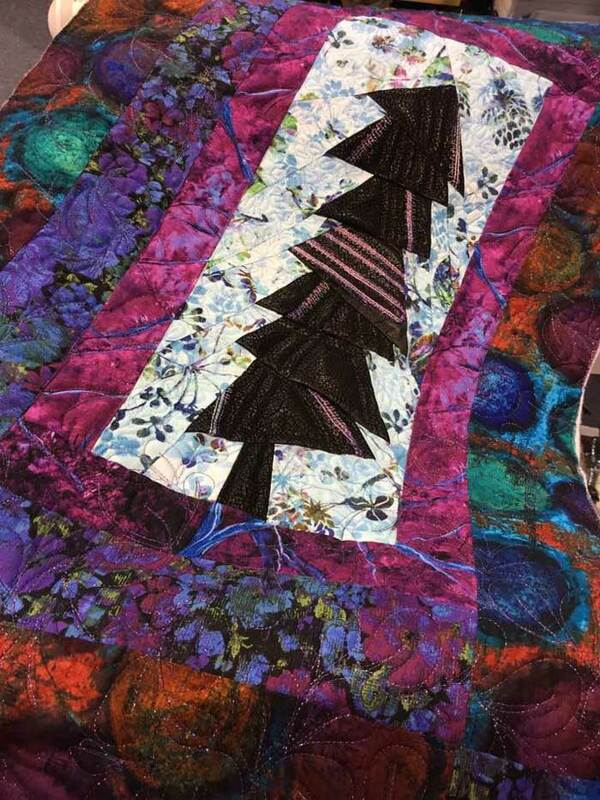 You can see my mom used some of Carol’s rust dyed fabric in her quilt. 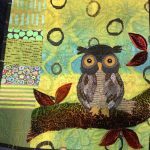 I used a wonderful piece too in my quilt; the detail photo below shows it as well as the free motion thread painting/quilting I used. 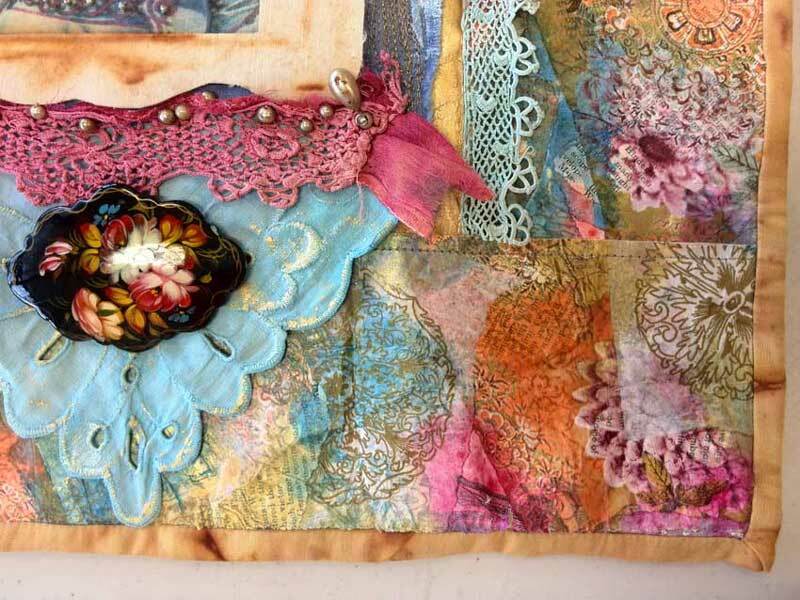 I now sell my own Rusted Fabric Collage Pack — it adds such a great touch to fiber projects! 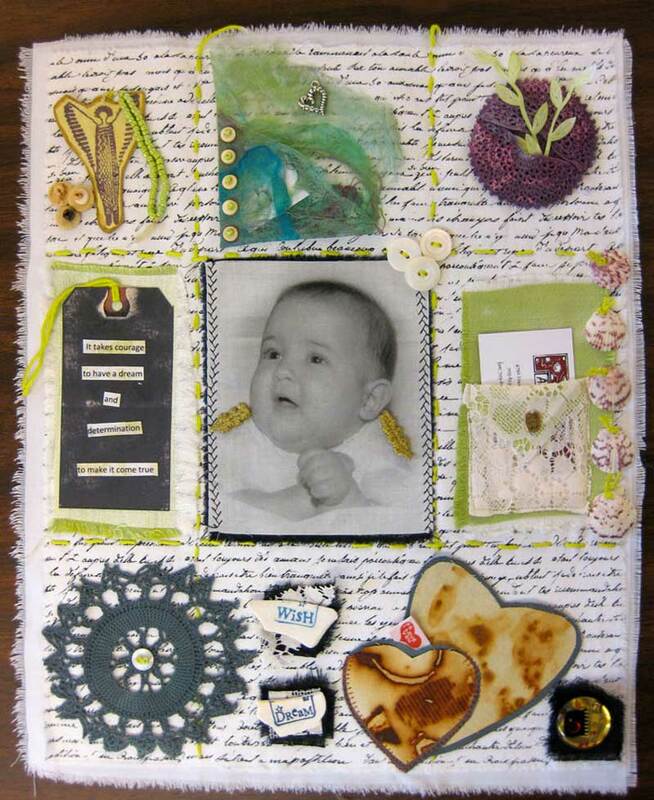 I hope you’ve enjoyed this walk down memory lane and are inspired to create your own art quilt! 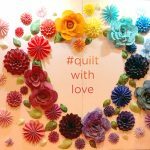 There are two Quilt Markets (credentialed trade show for shop owners, fabric companies, etc.) each year. 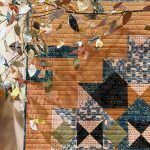 The biggest is each fall, always in Houston just before the huge International Quilt Festival (which takes place November 2-5, 2017). 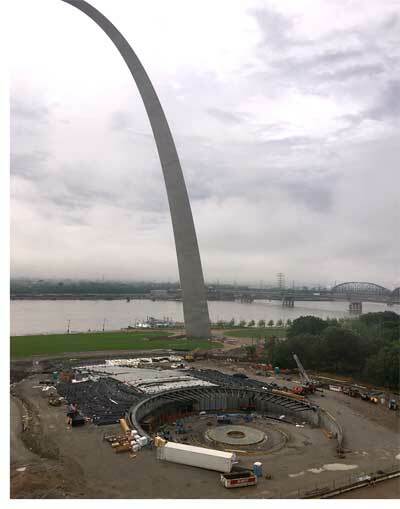 The Spring show changes locations each year; and this year it was in St. Louis; a fact that was reinforced each time we had the chance to take a look from our Hotel to see the iconic Gateway Arch! 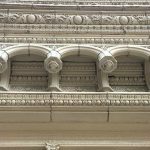 Our walk from the hotel to the Convention Center included passing by buildings featuring beautiful architectural details (see above and in my gallery below). Most of these were likely built in the 1920’s and 1930’s and unfortunately, many of them are empty. So sad! 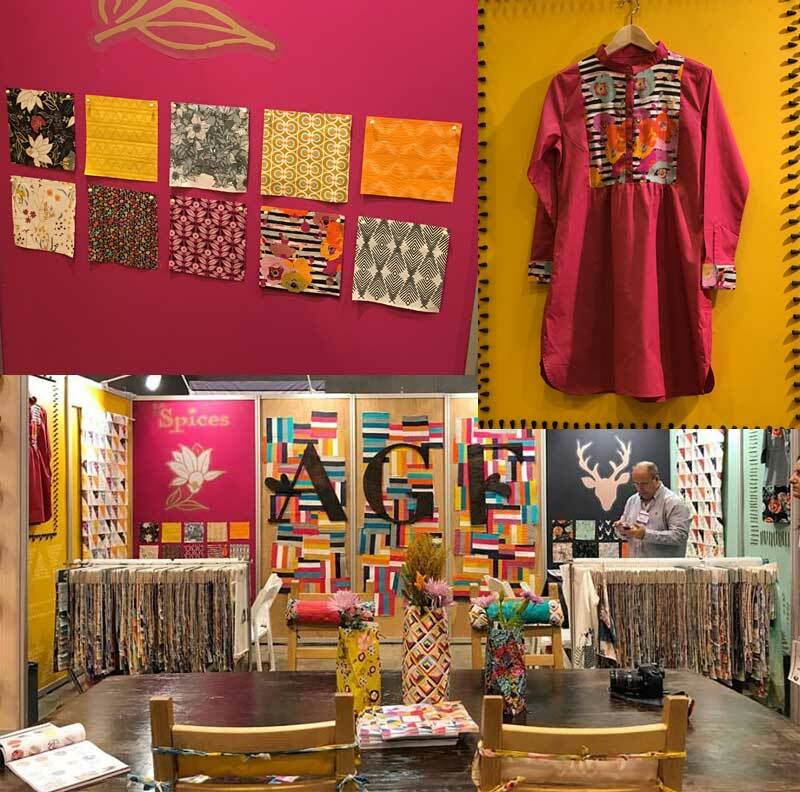 Artistic Artifacts was there with a booth exhibiting and selling our Batik Tambal Exclusive Batik fabrics (pictured at the top of this post and here), handpainted batik panels and our artist quality textile paints. 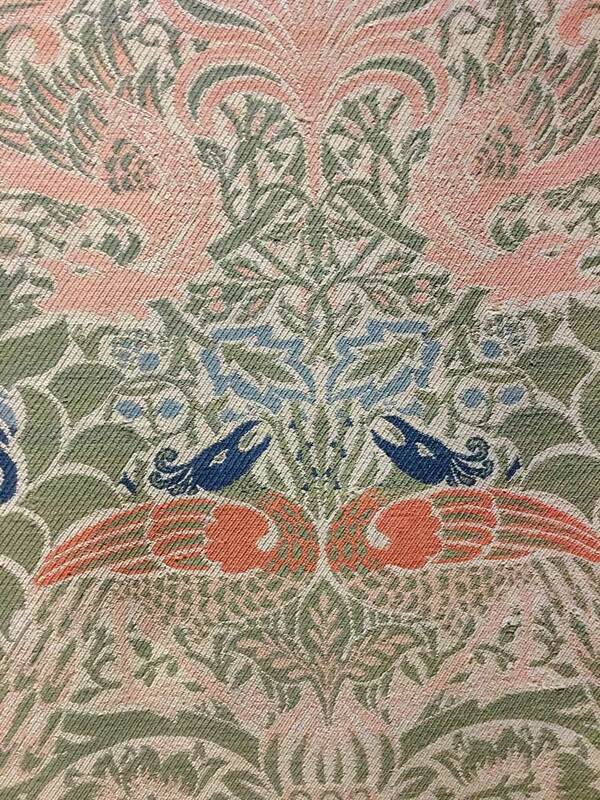 From our Batik Tambal Exclusive Batik, I’m excited by our new Woodstock 2 fabrics (pictured above)! 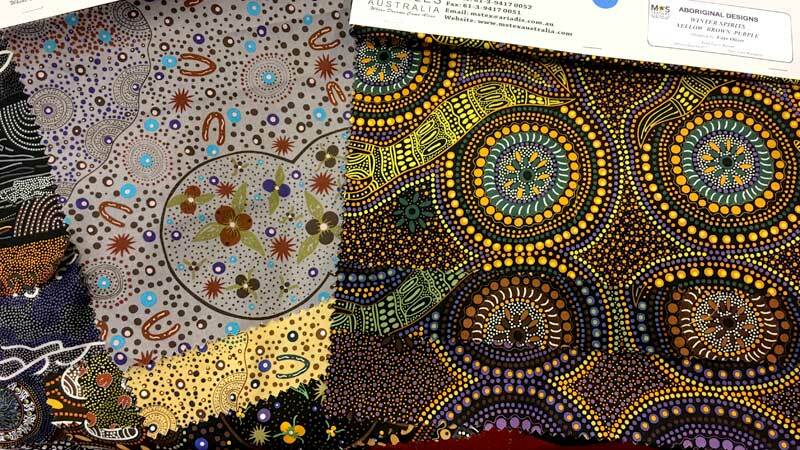 I also have new colors (pictured above) of established designs, Folk Life-Paisley Leaves and Color Sponge. 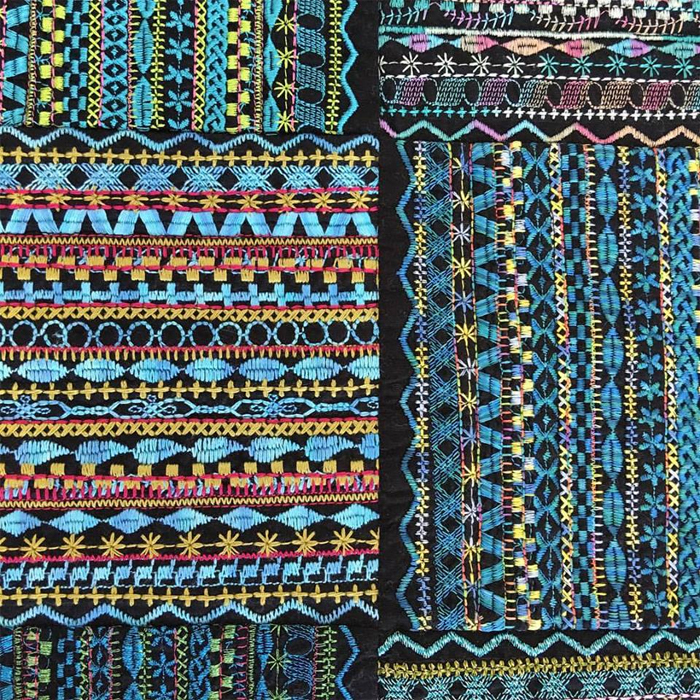 All of these new Batik Tambal Exclusive Batiks will be available to our customers in approximately two months. 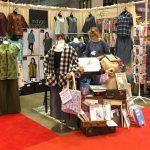 A lot of time is spent walking the aisles looking for inspiration, like the above beauty by Sue Spargo (take a look at the gorgeous colors she selected for her WonderFil Eleganza collection). 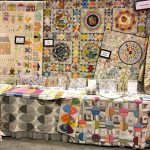 You can view a lot more eye candy from Quilt Market in my gallery at the bottom of this post! 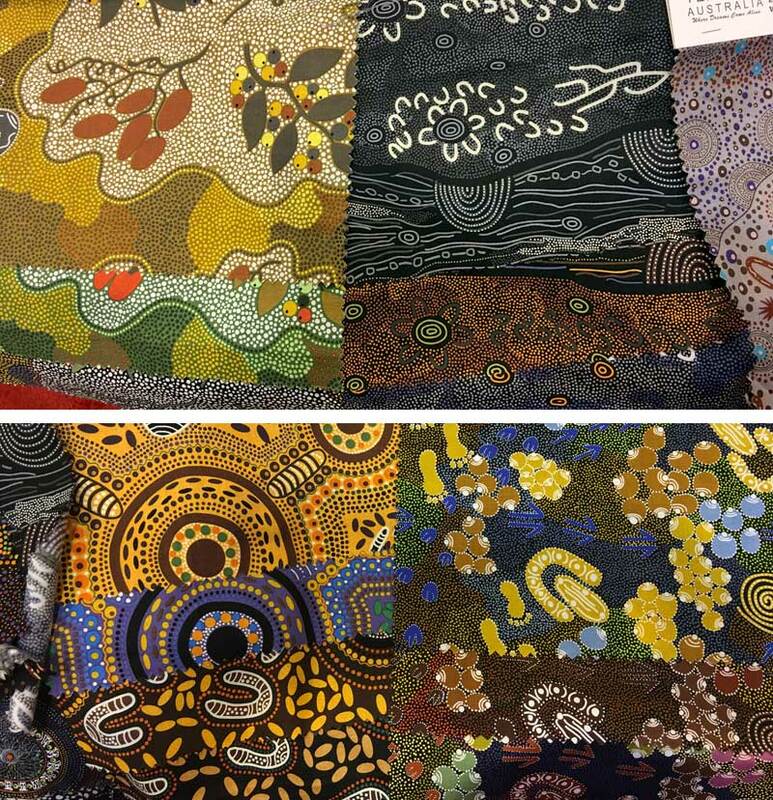 I made my usual stop at the M&S Textiles booth to see what is new with our popular Australian Aborigine-designed fabrics. 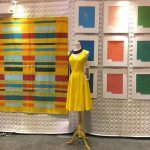 I ordered 22 new patterns! You can get an idea of what’s coming in the photos above and below. Stay tuned to our website — they are expected in approximately two weeks. 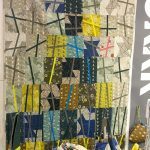 I was able to have a quick trunk show with fiber artist and fabric designer Marcia Derse. I have always loved her work! 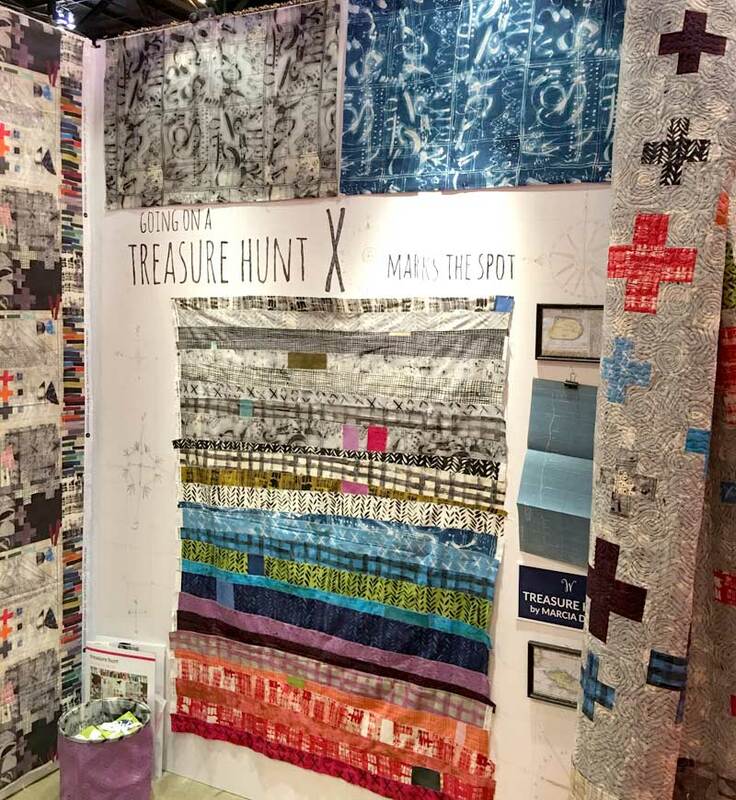 Marcia’s Treasure Hunt line (pictured above) will be available in the shop in October. 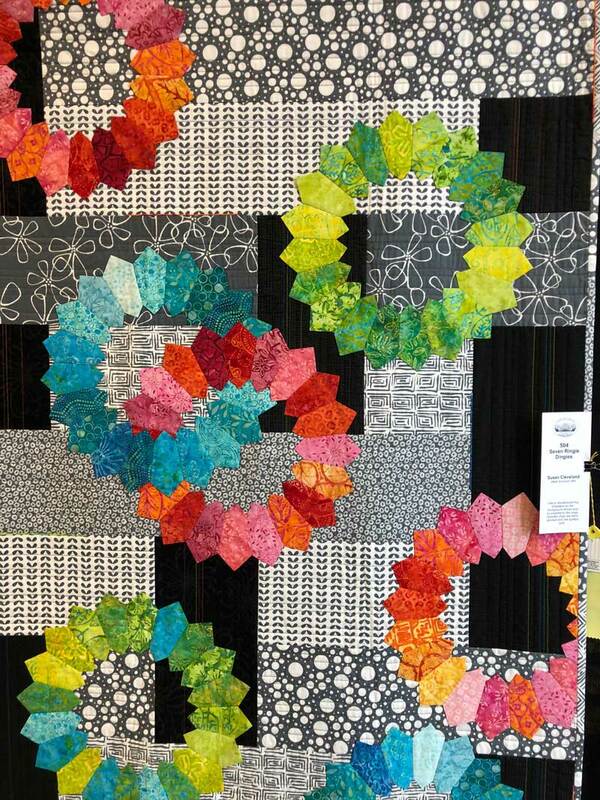 We hope to add her solids to the store (pictured below) in the future as well. 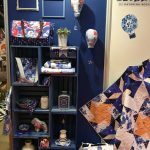 Maker’s Home by Natalie Barnes (pictured below) of Beyond the Reef Patterns will also arrive in the shop in the fall or early winter. 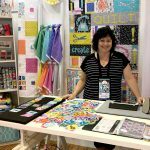 This is her second line for Windham Fabrics and includes her signature hand drawn flowers and fun black &white prints (and you know how much I love black & white fabrics). 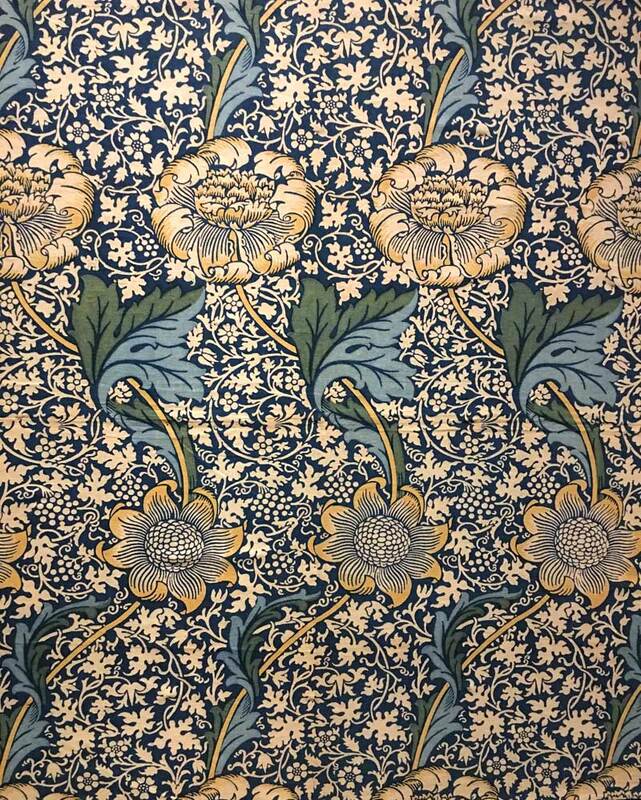 I’ve been looking for the right kind of floral fabric to add to the shop and thought my customers would love this line (more views in the gallery). 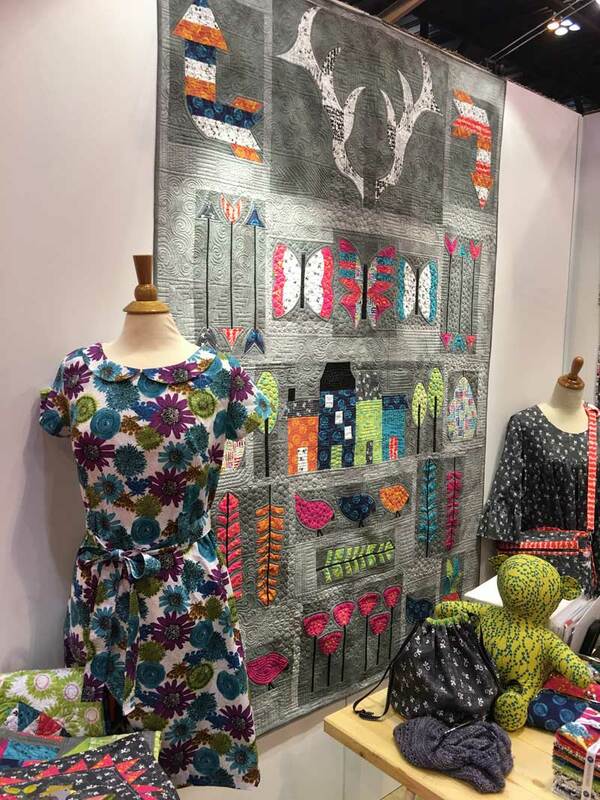 And we spent time in Art Gallery’s booth (their booth photo below with my detail shots) touching and feeling their knit, voile, and cotton fabrics. 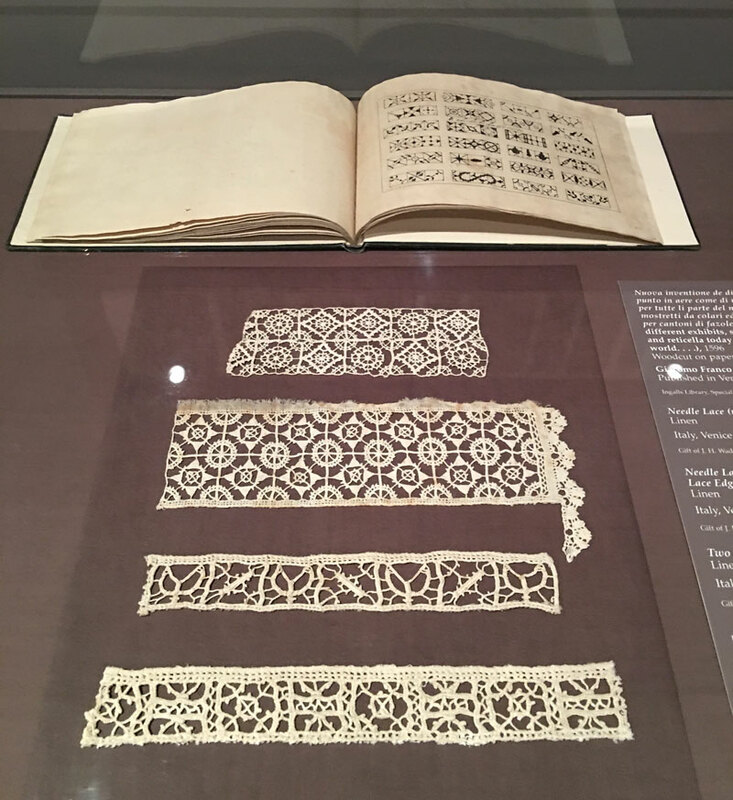 We’d like to add knit fabrics to Artistic Artifacts…what do you think? Good idea? Let me know in the comments!. 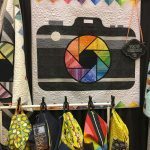 Below, my photo gallery for more from Quilt Marke — click on any photo for a larger view or to see it as a slideshow. …as is perhaps obvious from the big smile on her face in the photo above! 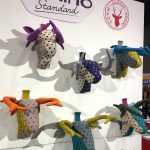 It was taken by her friend Liz Kettle of Textile Evolution, another attendee at the Summit. 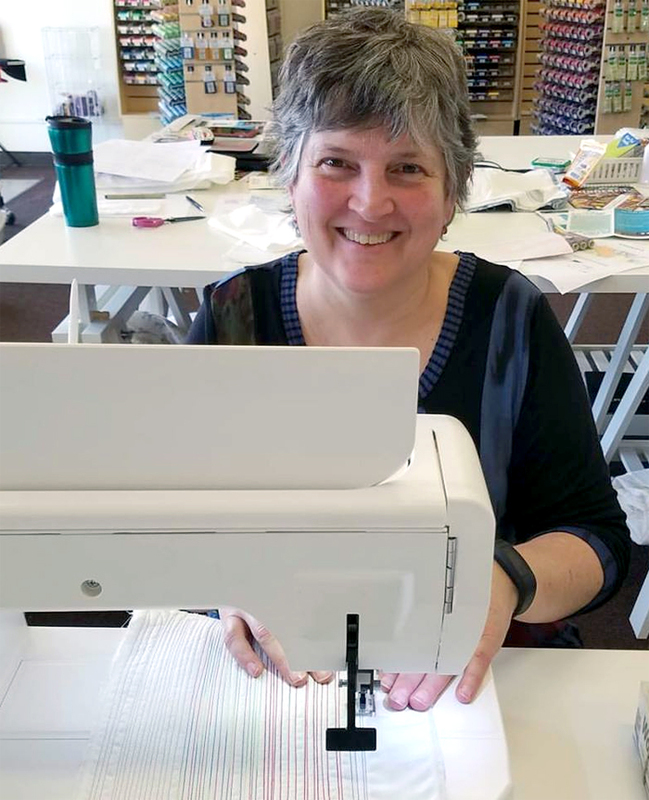 Liz (pictured below), a certified “Threaducator” with WonderFil, will be visiting Artistic Artifacts in June for her 4-day creative retreat, Stitch Journeys. 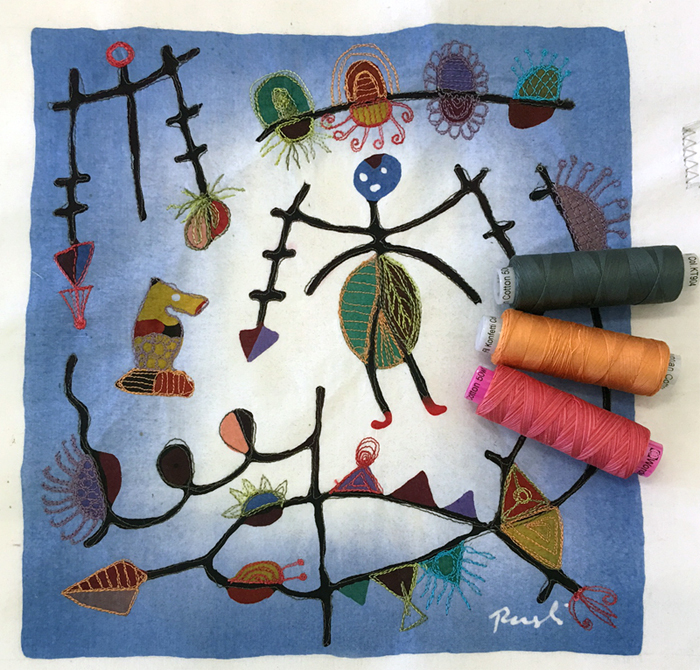 Suitable for beginners, attendees gain mastery of their sewing machine and develop the confidence to tackle any kind of specialty thread and tame their tension fears as they create a sample fabric workbook that serves as a permanent, creative reference tool. This is her only time teaching on the East Coast this year, so if you can, plan your vacation around traveling to Virginia and attending! 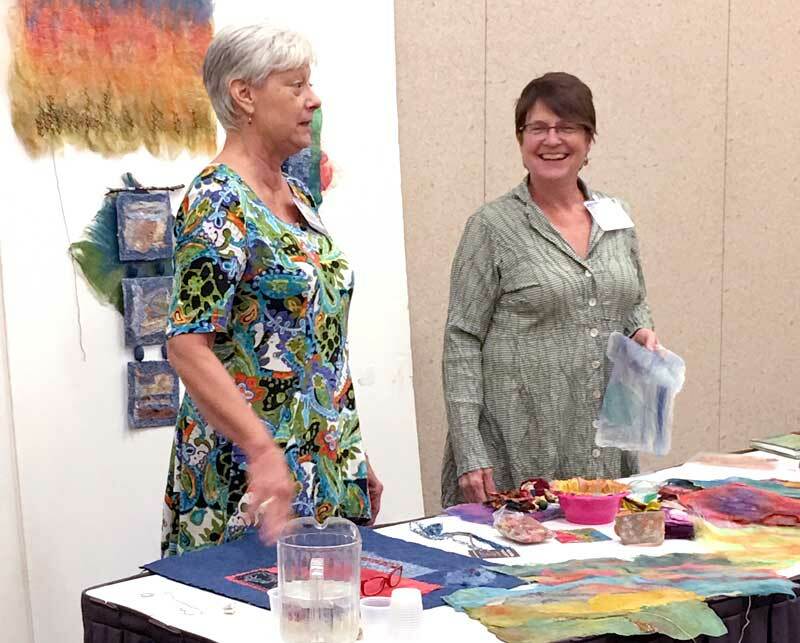 Judy and Liz are collaborating in the development of an upcoming Threaducation Center class. 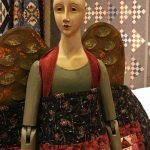 They used a handpainted batik panel by Rusli, which is enhanced with machine quilting and thread painting using both Konfetti™ and Tutti™ threads by WonderFil. Konfetti and Tutti are both 50wt, 3ply 100% long staple Egyptian cotton threads that are double-gassed (burning off the lint from the thread two times) and mercerized to create a soft, clean, and lustrous finish. 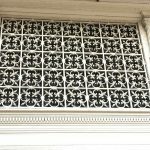 Additional detail views above and below. 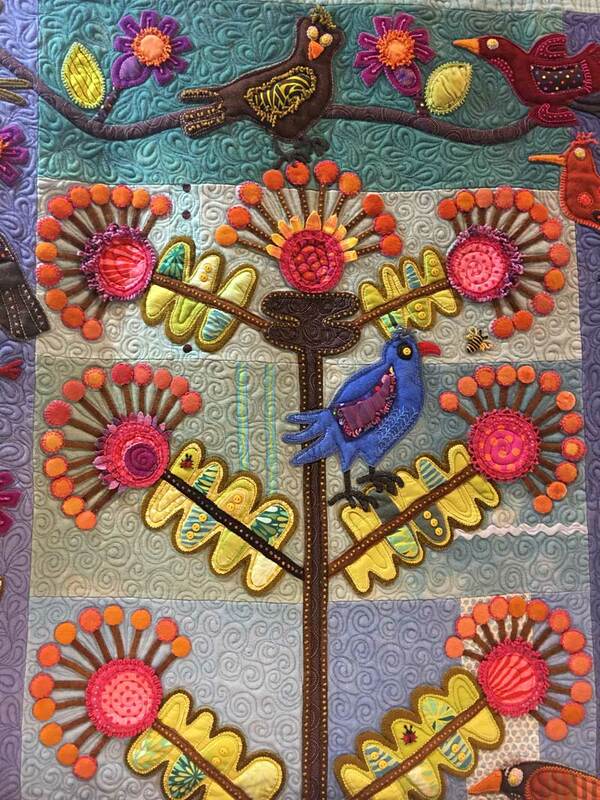 Below is Judy’s favorite thread sampler, posted on the Artistic Artifacts Facebook page. When she returns we’ll have to get the details from her! 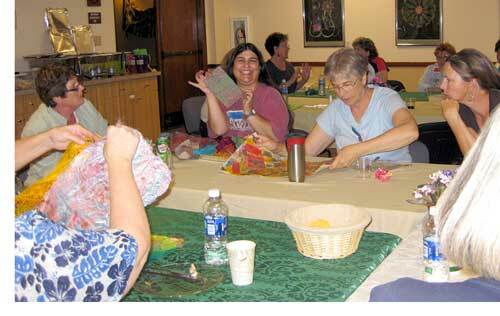 But you know fiber artists…even after a full day of studying, they are still up for more fun! 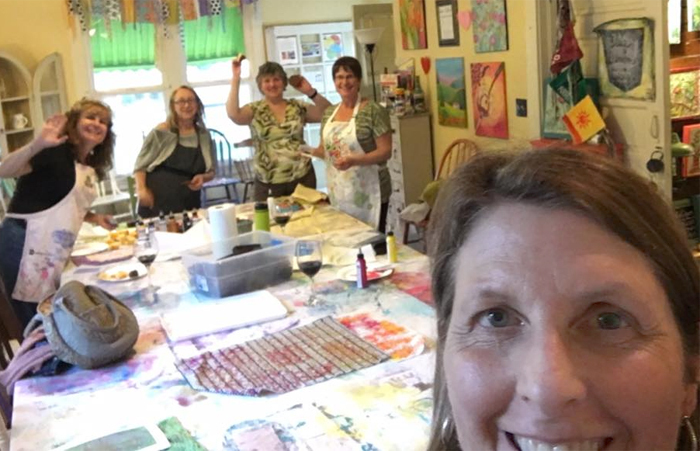 You can see Liz and Judy, plus Bernadette Kent and Alicia Campbell in the background of this selfie taken by Libby Williamson of Blue Denim Design at The Dragonfly Shops & Gardens in Orange, CA. 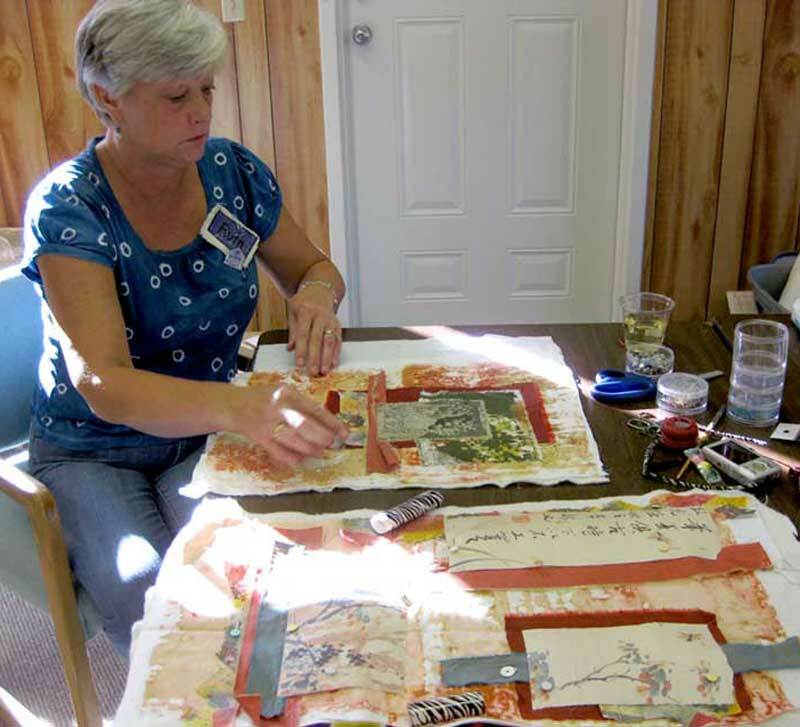 They were busy having fun with block printing and thermofax printing on fabric. Judy never misses the opportunity to share her love of wooden printing blocks! 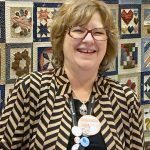 And on Saturday, March 25, we are delighted that Kay (who quilted the above beauty as she demonstrated various WonderFil threads during the recent AQS show) will be sharing her knowledge during our exciting WonderFil Boutique Show & Tell event. Sponsored by WonderFil™ Specialty Threads, we will hold two complimentary seatings, morning and afternoon, of this inspiring and informational session. 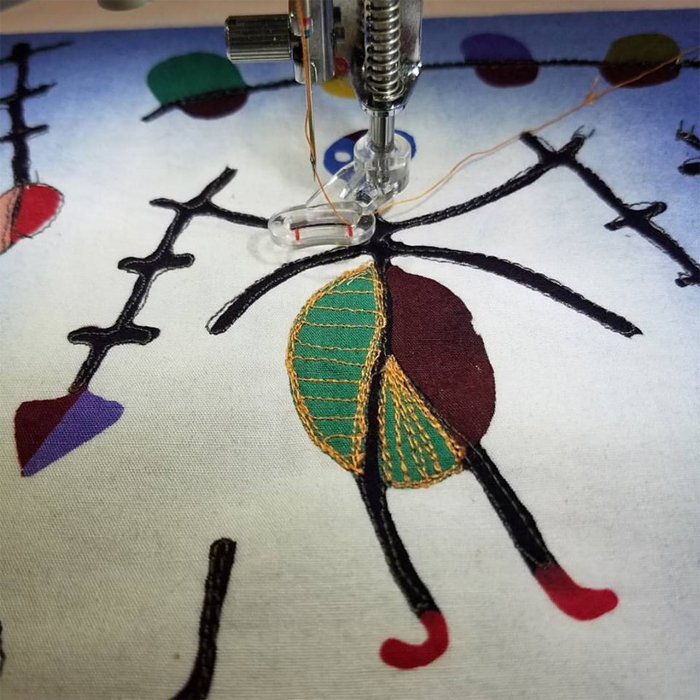 Get inspired with samples of threadwork and demos using the many specialty threads by WonderFil! Reservations are required as seating is limited, so don’t delay and claim your spot! 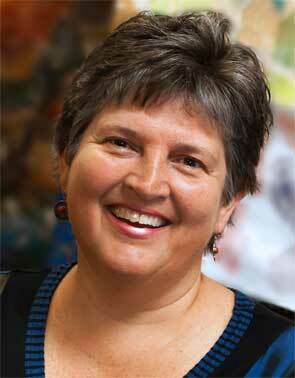 Email Judy Gula or learn more about contacting Artistic Artifacts. 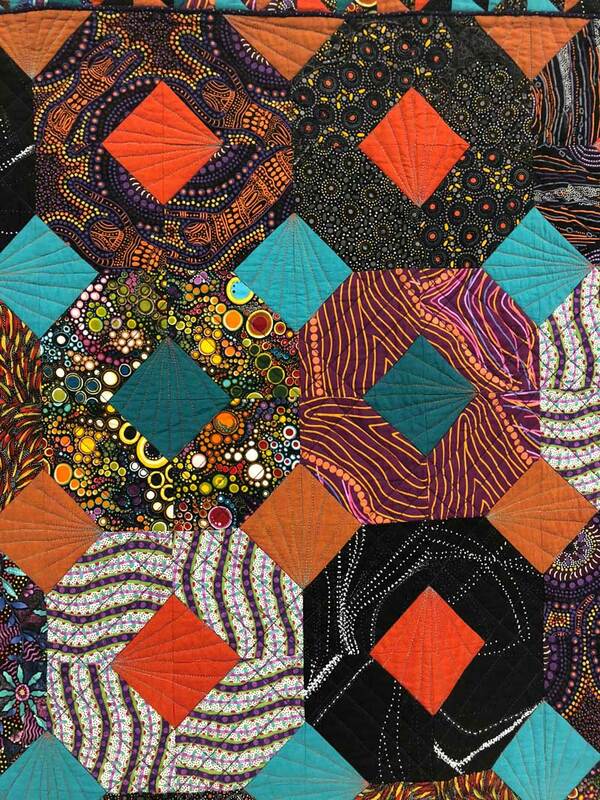 Artistic Artifacts has been selected by Feedspot as one of the Top 100 Quilting Blogs! 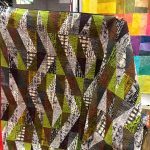 Subscribe to the Artistic Artifacts enewsletter for new product info, sales coupon codes and more! 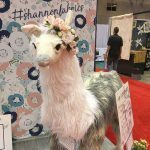 We’re a Stop on a Beautiful Blog Tour!